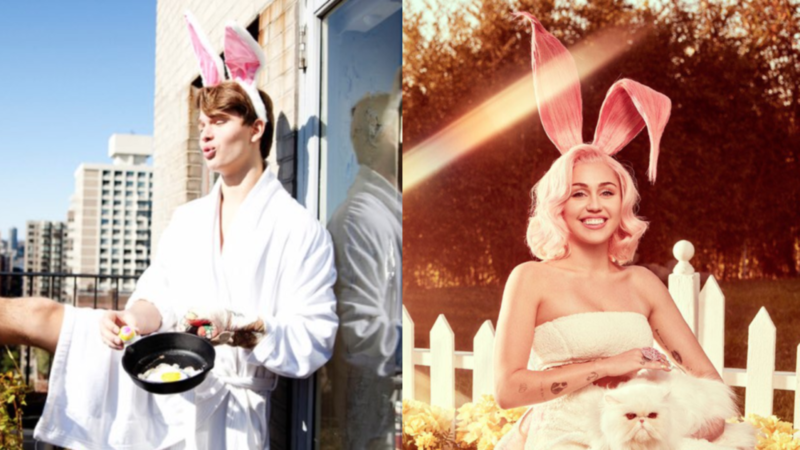 Here’s a little something to get you extra excited for Easter… Somewhere in Brooklyn, Ansel Elgort is throwing his bunny ears in the trash and the Easter Bunny has hung up his basket for good because there’s a new Easter Bunny in town — and she’s here to slay. If there’s one thing we’ve come to know and love about Miley Cyrus, it’s that she’s “go big or go home” personified. In February, the “Wrecking Ball” singer posted a gorgeous photo shoot in time for Valentine’s Day — and now, she’s back at it again just in time for Easter. The photos — which were taken by Vijat Mohindra and are all lit with a dreamy, warm glow — range from Miley Cyrus posing in bunny ears like pin-up perfection to being, um, spanked by the Easter Bunny. All in all, you might even say the photos are in true “she’s just being Miley” form. But for real, where were these photos when the LaGuardia High School student council needed them most! The old Easter Bunny could never! Seriously though, we love the commitment she’s bringing to this Easter look — and other former themed-calendar models should definitely be taking notes. We can’t wait to see Cyrus continue to bring her A-game to the holidays to come. We wonder if she has any plans for Tax Day!